AT&T GoPhone may soon be rebranded to AT&T Prepaid, as the carrier offers new plan rates for its prepaid services. Even though the company’s website still refers to GoPhone, a recent post on Reddit shows a picture of an AT&T poster ad that reads AT&T Prepaid and shows the new rates, suggesting the change might indeed be on the cards. The cheapest plan the company now offers is certainly an attractive one and gives you 1GB of data, unlimited talk and texts in the US, and unlimited texts to over 100 countries. The plan costs $35 a month and is quite an upgrade for AT&T customers, as the company’s ‘vanilla’ $30 prepaid option does not include data usage in the bundle, and 250MB would cost you $5. The mid-price plan that sells at $45 per month, gives users 6GB of data, as well as unlimited calls within and between the US, Mexico and Canada. The most expensive prepaid option costs $65 a month and offers unlimited calls and texts across the same countries, but also unlimited data. However, the carrier may reduce speeds after 22GB of usage, which should otherwise run at up to 3Mbps. All plans are eligible for an AutoPay discount, which takes $5 off your bill, meaning that you could get the cheapest option for $30 a month – on par with AT&T’s regular no-data monthly plan. AutoPay is a direct debit system that automatically pays your bill when it’s due, once you’ve signed up for it. With AT&T’s prepaid services, you can use your own device, instead of buying a handset from the respective carrier, as is the case for T-Mobile’s prepaying customers. Comparing AT&T’s current prepaid plans with T-Mobile’s, the former’s plans offer more data in the mid- and high-price monthly packages. However, T-Mobile will give you 5GB instead of 1GB, should you go for the cheapest, $30 option. 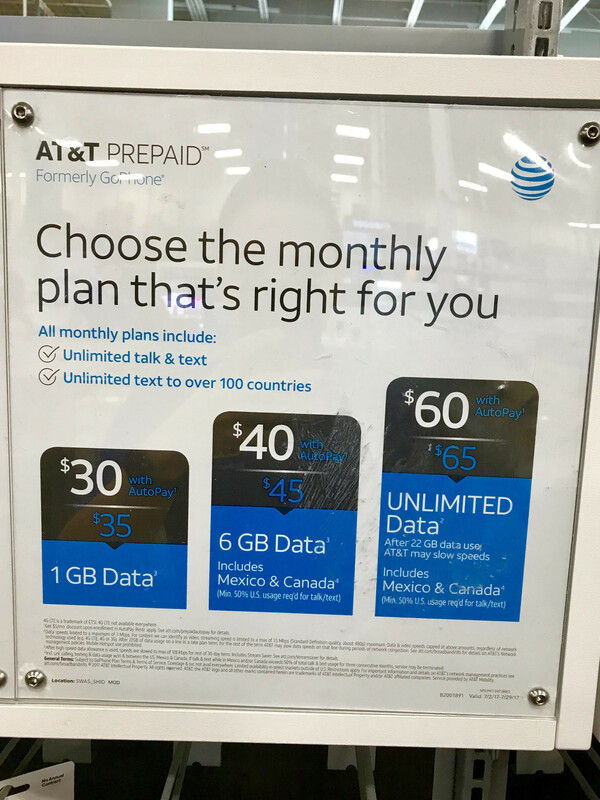 At the same time, AT&T’s data options seem more attractive than those at Verizon, as the last offers unlimited data packages at $80 per month, which is considerably more than AT&T’s $60 charge (provided you have signed up for AutoPay). AT&T is the second largest carrier in the country, generally known for the reliability of its network. Whether or when exactly GoPhone will be officially renamed by AT&T Prepaid, is really a matter of not-so-important detail. What we are more concerned with are the plans the company has on offer, and they do seem attractive. However, we would advise you to keep an eye out for both GoPhone and Prepaid signs in the time before the rebranding of the service is rolled out at large. I got T-Mobile prepaid and get unlimited at their highest speeds for only $15 more per month. I wouldn't brag about paying more for lesser quality and coverage. I got those speeds and slightly better with 3G. WTF at&t ? Stop being so greedy. What can't you do at 3mbps? If you don't like it....well.. you know.... go elsewhere. Currently a GoPhone customer and just recently switched from the old 8GB $60 plan to the new $45 ($40 w/ auto pay) plan with 6GB. I rarely use that much data, so it was a no brained to switch. Plus, you still get full data speeds for LTE. Strange that the new $65 plan limits speeds to 3Mpbs. I get that GoPhone has more priority than Cricket and other AT&T MVNOs, but still. Might as well give customers full access to the LTE speeds, since GoPhone is supposed to be their "premium" prepaid service. The 22GB plan cannot be used as a hotspot! It's ridiculous that it can't be used for it, but I have no choice. Verizon is WAY TOO EXPENSIVE, and T-Mobile has no data coverage where I live.